I’m a huge fan of brownies – and chocolate chip cookies – and Oreos. What if the three of them got together and morphed into the best of both brownie and cookie worlds? 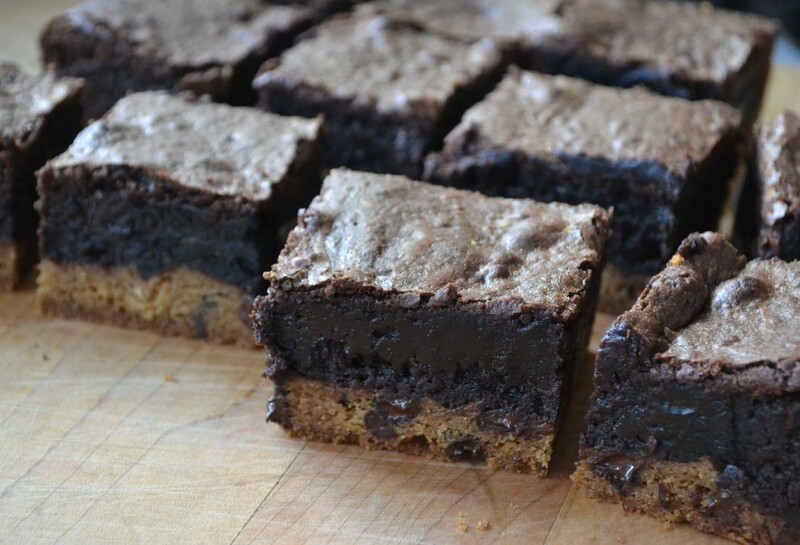 These brownies have a chocolate chip cookie dough base, sandwich cookies in the middle, and a fudgy chocolate brownie top. This is how to win friends and influence people. In a large bowl, beat the butter and sugars together until pale and fluffy. Beat in the egg and vanilla. Add the flour, baking soda and salt and stir until almost blended; add the chocolate chips and stir just until combined. Press evenly into the bottom of a buttered 9×13-inch pan. Top with a single layer of Oreos. To make the brownie batter, In a small saucepan, melt the butter and chocolate over low heat. Stir until smooth and if you used a pot, pour into a bowl. Stir in the sugar, vanilla and eggs; blend well. Add the flour, cocoa and salt and stir until almost combined. Pour over the cookie dough and Oreos. Bake for 40 minutes, until set. Cool completely in the pan before cutting into squares. Posted in Recipes, Desserts and tagged Chocolate, Cookies, dessert, brownies.